Oh, Friday, I wasn’t sure you were coming this week! Straight in to rolling to warm up tonight. Remembered my mouthpiece, yay. In one roll I got stuck with a brand-new guy. Was not happy about that; I would much prefer to have known training partners right now. At least most of them have enough control that they won’t hurt me; the ones that don’t, at least I know what they do have. My normal spiel to folks is, “Yes, I have an injury, but I’ve been training long enough that I know how to protect it and will tap or stop us if I need to. You just roll.” And we go from there and I hope that they can forget about the injury and just roll, and I’ll do my limited thing and sometimes stop the roll if the knee gets stuck at a bad angle and will let them have the pass or sweep or whatever they’d wanted, minus the knee being stuck. But this kid got a longer introduction to my knee and a warning. I do not want to mess around with idiots where this knee is concerned. He promised me that he was new, so I had nothing to worry about. *snort* He did at least limit himself to the one or two techniques he’s been taught in class, so that was actually good, though my knee was still getting plenty of abuse as he tried to muscle everything and dig his elbows in to everything. Drilling was side control to armbar. Drilled with Janet, then a couple more rolls to finish up. All rolls tonight were me starting to do it the “wrong” way and having to stop myself and try again. That left foot it all eager to be hooking again, but I can’t let it. So it was a lot of starting, stopping, retrying, stalling when I couldn’t figure out how to move the right way. My face and neck feel — and look — like they’ve been rubbed with sandpaper. My legs and arms have mat- and velcro-burns all over them. I’ve had “choke cough” for a few hours. I’ve been grinning for hours: I could drill and even roll tonight!! Part of it was the technique — it didn’t involve much in the way of knees themselves. Justin had us build a sequence of kimura from guard, to guillotine, to crucifix sweep. My knee only twinged a few times, and that’s because I’d plant the toe to pop my hips. Did not like. Heh, being choked was… weird. As soon as there was any pressure, I was ready to tap, but I tried to tough it out until my partners could actually do it. Also, I have no idea what my brain has been doing over the last 1.5 months, but it was pulling out crazy inverted stuff, passing & pressure, sweeps and transitions. I was kind of nice, almost like I remembered some jiu-jitsu! got to roll with Josh and meet his wife Jen. Josh also helped coach me in some matches and gave me a huge list of things to work on. 😉 Thanks a ton. So I tried cutting weight last week, in the hope that there would be other women in my weight class. But instead of losing the 3 pounds like I asked, however, my body decided to gain 3 pounds. W. T. H. Bad, body, bad. Since I knew I couldn’t lose that much on Thursday & Friday alone, I ate normally those two days. In the end, though, it didn’t matter, as I weighed in fully clothed and was still the smallest blue belt female. I left work early since Google Maps told me it would take 3 hours to get to the far side of Greensboro. When I plugged the address in to my GPS, though, it only said 2 hours, so I didn’t know who to trust. As I was leaving town, my GPS kept trying to route me east and down the back roads. I wanted to stay on the interstates, though, so I ignored the GPS and headed down the interstate. I didn’t get far before I got stopped by an accident up ahead. According to the signs, I was 10 miles back from it, and traffic wasn’t moving. Spent 20-30 minutes creeping forward to the next exit. My GPS tried to make me turn around so it could send me east again, but I ignored it again. I’ll just take this other route that will take me around the accident and get me back on the interstate further down. Apparently everyone else knew about that way, though, as there were tractor trailers converging from three directions, and traffic had stopped moving that way, too, since it wasn’t intended to handle that much traffic. Plus it was now after 5pm, and the post-work traffic was tangled in that, too. So I finally listened to my GPS and let it route me back around and down the back roads. I lost an hour and a half (!!) trying to get out of my own county. Ree-diculous, I tell you. So I finally really left just as it was getting dark. My GPS took great delight in sending me careening down some switchbacking mountain roads (which I’m sure if I drove in the daylight would scare the pants off me — but since it was dark, I couldn’t see how close to a sheer drop I actually was), making me switch roads every few miles, and not showing me that the road ahead forks and that my road is not the one that continues straight. She would announce, “Recalculating,” in that smug voice and send me scrambling to figure out how to turn around. And the few times I finally was on the right road and doing good, I’d end up behind someone who was going 5-10mph under the speed limit. Called Chrissy when I got to the Greensboro city limits to tell her that my GPS claimed I would be 5 minutes late for weigh-ins. (Which is just silly because I left 3.5 hours ago for a 2-hour drive!!! Anyway.) I was 10 minutes late with all the traffic lights (and another “Recalculating” misstep). They waited for me, and then she told me to just take my shoes off and weigh. Came in at 133.x, and she said I was still the smallest blue belt female. At the venue, I met Josh and Jen. Later Josh and I rolled to warm up, and then he had some advice for me. Seems I’m still leaving a limb behind in some positions and doing nothing to get it back. The whole tournament experience was great overall. Wins are great, but then I think it’s too easy to assume you know what you did right in them; in losses, though, you know you did something wrong and so will look for it and try to fix it. But maybe the best thing was that I was trying to use what Josh had just told me, plus he also had feedback for me from the matches he saw, so I was able to start working those in immediately. Also, he pointed that I need to hit the weight room. Which is going to mean finding time to go disassemble and move my power rack from my parents’ house and set it up in my basement. And at the end of the day, I have two new friends in North Carolina and an invitation to come down for Women’s Open Mats down their way. There were 3 of us for Intermediate We actually did the absolute first, which oddly enough just had me and Mary, though we were the same weight class, and then Barbara did the weight class division. First match, me against Mary Holmes from Team ROC. She finally got me in guard and locked on to my wrist; I knew I was in trouble, and then she armbarred me with this armbar that included a little twist in it, so that I couldn’t get my weight back down as that put pressure on the outside (I think) of my elbow. She said it was from Dave Camarillo, so I’ll later have to pore through Submit Everyone, which has a giant chapter on armbars, and see if I can’t find it. Match went 6:58. First match with Barbara, a friend from Richmond, Team Yamasaki. She also caught an armbar at one point that I seriously considered tapping to — and I apparently raised my hand in preparation — but then she shifted and I thought I had an escape so drove my raised tapping hand out to post at the same time that she shifted again and pulled me back over. My hand hit her knee (I know I thought it was the mat), but the referee decided that I’d tapped and stopped the match. I didn’t see much point in arguing, plus Barb and I both had more matches ahead of us, so just let it go. Match went 3:53. Especially after I’d reffed later, I understand how sometimes hand movements are ambiguous: I had a guy who was apparently fanning himself with his hand, which looks exactly like tapping air; I called the tap, he protested that he hadn’t tapped, and his opponent hadn’t let go (because he hadn’t felt a tap), so I let them continue. Fan boy was tapping for reals within 10s anyway. I also had several false alarms where I’d dart in to stop the match but both guys continued as if nothing had happened, so I assumed that nothing had. Anyway. Second match in nogi absolute was against Mary again. She armbarred me with the same armbar!! !, only much faster this time. 2:37. Yeah, Mary again. Yeah, Armbar again. I’m sensing a pattern here… *shifty eyes* 4:52. Oh, yes, this was the one with the takedown that didn’t work out quite as well as she expected, lol. My first match here was against Brittany. I pulled guard, and almost immediately the arch in my left foot completely cramped and locked up. When I exclaimed and grabbed it, Brittany was nice enough to give me space and let me massage it out (which involved punching the bottom of my foot until it released). (P.S. Owwww!!!!) I assumed I would be disqualified on that, but she said she didn’t mind if we started again. Very generous of her, and I appreciated that very much. Somewhere in the match, she got me with a nice knee to the eye, and I’ve got a black eye to show for it. Actually won this match with a RNC. I remember that as soon as my arm slid in, I knew it had clicked perfectly in to place, I heard her coach say, “You’re okay, Brittany.” Sorry, coach, but that one was in tight and I knew it. Match went 7:02. Second match was… dun dun dun!… Mary again. It was over quickly, as I expected her to feed for the armbar as she had been doing, and I was so focused on defending the armbar that I ignored all other possible submissions from technical mount — and she snatched up the bow-and-arrow. Doh. 1:11. My teammate Robert came down to compete, as well, though I didn’t see much of his matches as I was either competing or reffing at the same time. His daughter told me he got 3rd in his gi division, though. And Neal, who trains with us some Saturdays, also came down and competed in nogi divisions. He helped me warm up before one of my nogi matches. I didn’t hear how he did. After I’d had some time to change, eat, and rest, Andrew sent me over to relieve Josh as referee so that he could go compete in his purple belt division. And they called purple belts right in the middle of a match, so I just crept out there and took his place. And then generally had to act as if I knew exactly what I was doing. Holy cats! I think I was more nervous for this than I was for my own matches. Thankfully it’s all Submission Only, so I didn’t have to track points. I’m not sure that I could have done that many things at once! I did try to practice later, as the guys got tired and didn’t scramble as much, and silently counted out the points for sweeps, guard passes, and mount. Refereeing is hard work, even for Submission Only. Your brain is telling you either to passively watch the pretty grappling (or, in my case, a lot of cringe-worthy grappling, as I had lighter weight novice, beginner, and white belt divisions, lol) or to coach one or both competitors because you know exactly what they need to do. So, I was fighting against that and trying to run around the match and keep focused on the hand that would probably be the one to tap. Even then, I was still out of position for several taps as I couldn’t get around to that side quickly enough. I had one kid suddenly flee the mat to go throw up. I had no idea what to do then, and neither did my table worker, but thankfully Andrew was coming by just then and helped out. As I was refereeing, an actual fight broke out on the next mat over when a ref stopped a match & said a guy tapped, and the guy claimed he didn’t. Oh, and this morning I’m so sore! Everywhere hurts. Also saw in the paper this morning that my high school wrestling team just won their 11th state title, and by a landslide. Grappling again with US Grappling next weekend in Richmond. Us: So this evidence here proves that there is a problem. Them: Okay, so this issue is resolved. Us: … No, there’s a problem. See? There’s evidence. Right here. Them: Oh, okay. So the issue is resolved. Them: Right, so this evidence shows that everything worked as expected. Issue resolved! Warm up not pleasant. Stiff and painful and not all shook out by the end. Then two rounds of 2 & 2, with Will and with Andrew. Drilling was stacking armbar escape against armbar from guard. Will had some tips for me about keeping my hips tight to theirs and about stacking as soon as you feel that leg trying to slide over. It will all take some drilling (and thinking) for me to ingrain the new details. Rolled with Will for ~45 minutes. We were all over our end of the mat. Even some standup bits. It was good, though I very soon and then for the rest of the round felt like a total n00b. My goodness. I didn’t mind, though, which was odd: Less frustration (which is what normally happens), and just more resignation to knowing that though I would try (and I still did), it would probably do nothing. I did notice a few times that I was just playing/waiting around again (though of course at the moment I can’t remember where. That would be helpful information, dear. Oh, well). But he did tell me later that he was purposely turning it up to purple belt level. Good to know. Also good to know that I’m not anywhere near there yet; means no use worrying about it. Very short warmup, then to drilling. Continuing what they were doing last night: from clinch to snapdown to guillotine grip to takedown. Then from that takedown to the sit-through guillotine. Then to taking the back and sliding in a really tight RNC, Matt Hughes style. Drilled those for the rest of class. Draculino’s here in the morning! Also, last night my stylist didn’t cut my hair; instead, she wanted to cover the highlights and the roots, so she did an all-over color. 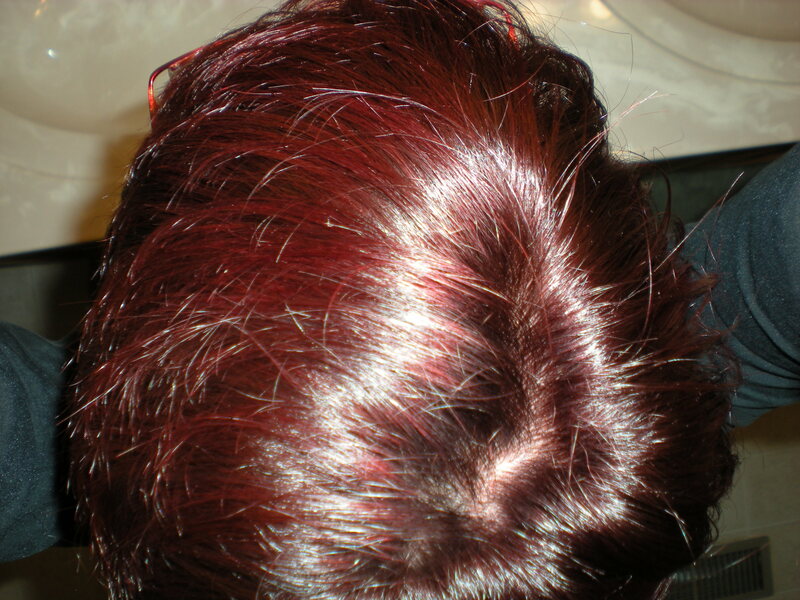 First, what it looks like normally (actually, it looks even darker than this — almost purpley, it’s so dark red). 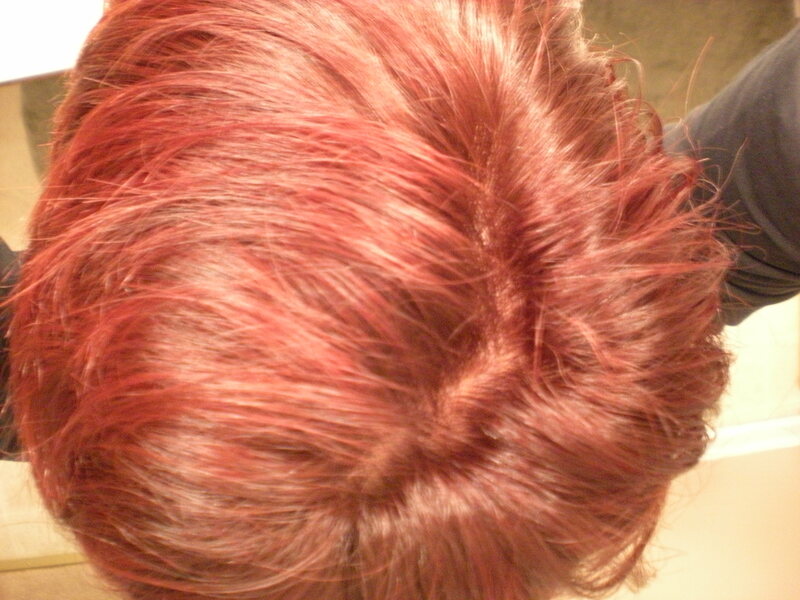 Second, what it looks like under a lot of light. I lurve.